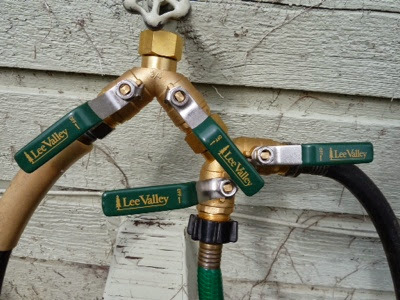 My Home and Garden: Confusing hoses...I knew this day would come. Confusing hoses...I knew this day would come. We had a simple little system of plastic levers to control the hoses out to the gardens. Now we have a bit more high tech and easier system. I can tell what's what even without my glasses on. They are leak proof so they don't spray water on me. Thank you Allan. You are a great Gardener's assistant. That is a fantastic idea Mark. Owari Satsuma Mandarin...in the house!! I made butter!! I made butter!! The beginning of the orchard overhaul. When dryer balls go bad. Is running a fan on your seedlings necessary? This is what real butter looks like. Mmmmmmm. Japanese Maples in their new home.